The hits keep coming for Hatchimals. Some parents are claiming the most-hyped toy of the season has a potty mouth. In videos posted on YouTube, the bird-like toys appear to say "f--- me" as they sleep. The news follows numerous complaints that Hatchimals are failing to hatch. 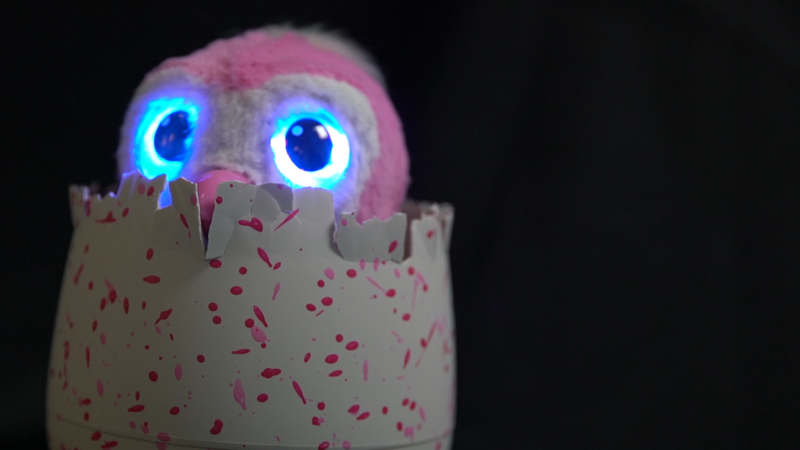 Hatchimals, which sold out in stores in the weeks leading up to Christmas, live in a plastic egg and "hatch" into interactive creatures that respond to touch. The toys make unintelligible noises and can repeat words or phrases that humans teach them. As of now, there aren't any restrictions as to what the Hatchimals can repeat. But the series of videos popping up online are similar, and parents claim the "f--- me" line -- only uttered when the creature is sleeping -- wasn't taught by their children. Some commenters believe the Hatchimals are saying "hug me" instead. Parent company Spin Master denies the toys are saying "hug me" or swearing on their own. It noted Hatchimals make unidentifiable noises while sleeping. "Hatchimals communicate by speaking their own unique language, which is made of up of random sounds, and by making other noises, including shivering when they're cold and snoring while they sleep," a spokeswoman for Spin Master told CNNMoney in a statement. "We can assure consumers that Hatchimals do not curse, nor do they use foul language." In crisis mode since Christmas, Spin Master is still responding to waves of daily complaints on Facebook (FB) and Twitter (TWTR). It had to increase the number of customer care representatives to respond to the onslaught of complaints, the company told CNNMoney.